Hello Friends, Happy Monday. Wow where did the weekend go, I just need one more day of rest. Thanks for stopping by today, its Mother's Day or Thank You inspiration over on La-La Crafts blog today. 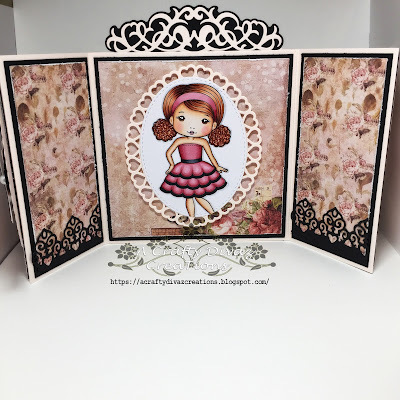 I am sharing a gatefold card using Fabulous Molli from La-La Crafts. I needed to send out a Thank you card so this was perfect. I used designer papers from prima for this card. For the front of the card, I used the pierced scalloped circle and the stitched nested circles and layered them to create a focal point. I added the love doves around the sentiment for the front of the card. The sentiment was stamped out using the bracket from the stitched elements set and the ornate scroll flourish is layered behind it. I added the scroll corner die to the corners of the card. I added a pocket to the gatefold and attached the filigree elements border which is my favorite die from La-La Land Crafts. I added the ornate border large die to the panels of the card. 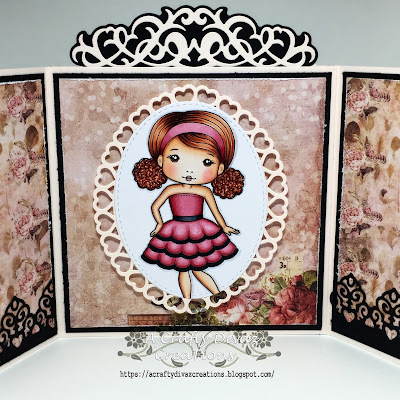 I added Mollie to the middle of the card and layered the open hearts dolly border behind her. I love this card and the way it turned out. That's all I have for you today, thanks for stopping by. Check out La-La Land Crafts blog to see what the other fabulous ladies created. Have a awesome Monday!